Rejuvenating the lips with fillers is the procedure of strategically injecting dermal fillers (we use Hyaluronic Acid) into and the surrounding parts of the lips to achieve a variety of results. This could be to enhance, shape, add volume or to even out the lips. Enhancing the lips is not always about enhancing just the lips. Filling around the lips may be just as important as well as replacing volume loss, that occurs over time naturally to achieve more youthful looking lip. Georgie Stevenson is a Graduate lawyer with a love of health, fitness and holistic living. 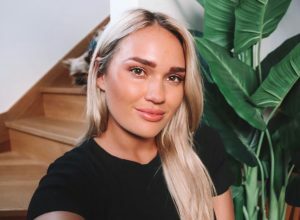 She has a Youtube channel dedicated to the tips and tricks on balancing full time work and still being able to feel good on the inside and out! Georgie initial journey with us was concerns about acne and acne scarring after battling for years with hormonal acne. You can read everything about the incredible results she has seen on her skin here or here. She’s continued her journey with us and this time we’re talking about Dermal Lip Fillers! Her desired look was fuller, plumper lips that looked as natural as possible. Our Registered Nurse and injector Liam is sharing and explaining all things Dermal Fillers and discusses the 3 steps to consider before having this amazing treatment done.